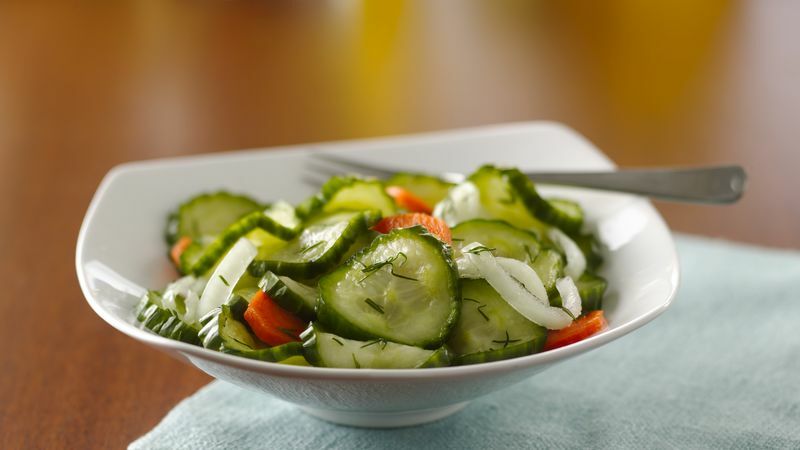 In 2 1/2- or 3-quart glass container, layer cucumbers, onions and carrot. Mix remaining ingredients until sugar is dissolved; pour over vegetables. Cover and refrigerate at least 24 hours but no longer than 2 weeks. Smaller cucumber varieties are used for pickles and are best for this recipe. Prepare pickles soon after bringing cucumbers home from the market. There are several ways to add color and flavor to these easy pickles. Slice a small bell pepper into thin strips for both a color and flavor boost. Add 1 teaspoon celery seed instead of the dill weed, or add a clove of garlic. There is no need to peel the cucumbers when they are fresh and not coated with wax.